Rep. John YarmuthHouse Democrats sit on the floor of the chamber. A group of congressional Democrats staged a sit-in Wednesday on the House floor to demand Republicans allow a vote on gun-control legislation proposed in the wake of the Orlando terrorist shooting. Speaking on the House floor on Wednesday, Rep. John Lewis joined Democratic lawmakers seated on the lower chamber’s floor, blasting Republican leadership for refusing to hold a vote on any significant gun safety bills. AshLee Strong, press secretary for Speaker Paul Ryan, said the House had taken a recess as a result of the protest. The cameras broadcasting images from the House floor were also turned off. “The House cannot operate without members following the rules of the institution,” Strong wrote in a tweet. 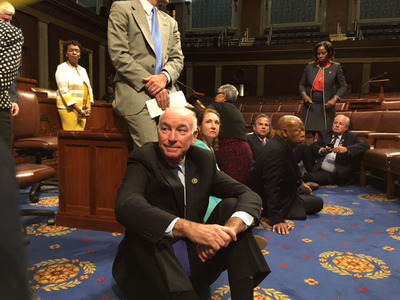 The sit-in came several days after a series of gun control measures brought by members of both parties failed to pass in the Senate. The Senate rejected bills that would have updated the background check system for purchasing weapons, as well as a bill that would have barred individuals on the FBI’s terror watch list from purchasing weapons. It’s unclear whether the Senate will vote on a narrower gun control bill spearheaded by Maine Sen. Susan Collins that would prevent individuals on the FBI’s terror watchlist from coming to the floor.